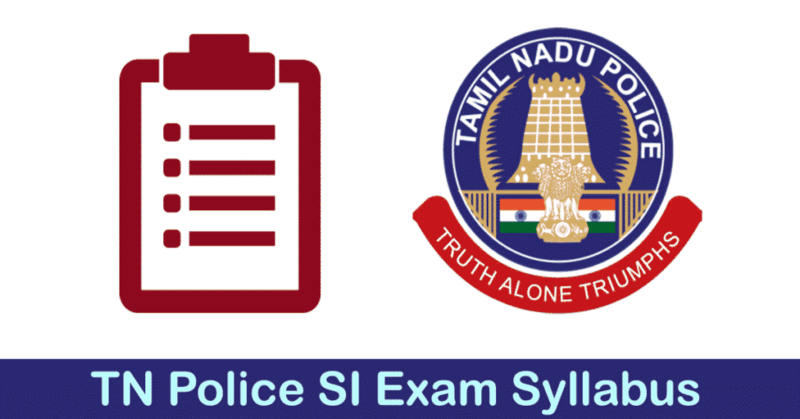 TN Police SI Exam Syllabus 2018: TNUSRB – Tamil Nadu Police 309 Sub-Inspector exam syllabus download link has been activated. TNSURB exam pattern also available to download. Tamil Nadu Uniformed services recruitment board has been released the notification for 309 SI Technical vacancies. The interested and eligible candidates can able to the recruitment from 11.07.2018 to 10.08.2018. The candidates are requested to download the exam syllabus to prepare for the examination. It is the heart of exam preparation. Tamilnadu Police Recruitment cell is recruiting 309 candidates to fill their sub-inspector vacancies. The candidates who are all taking part in SI examination are requested to download or view the exam syllabus and pattern. This is will be very much helpful to prepare for your studies. Generally studying with syllabus is a brilliant idea to get succeed in the examination. Tamilnadu police SI syllabus is available to download. Most of the job seekers failed to follow the exam pattern and question paper structure. Before going to prepare for the examination, candidates need a clear idea to prepare for the examination. For that need to understand the exam pattern and syllabus first. Here below find a brief review of Tamil Nadu police inspector exam syllabus 2018. Tamil Nadu police SI Exam pattern has been given below. This plays a great role while preparing for Sub-inspector examination. The candidates those who are succeeding in the examination, they are using this exam pattern. Usually, TN Police SI recruitment 2018 exam pattern has been released by Tamil Nadu uniformed services recruitment board. Aspirants are requested to follow the TN Police exam pattern 2018 while preparing for the exam. Physical Measurement Test and original certificate verification will be called for Viva-voce in the ratio of 1:3. The Viva-Voce will be conducted at TNUSRB headquarter. Candidates who are called for Viva-Voce should produce all the Original Certificates at the time of Viva-Voce. Here below you can view TN Police SI Exam Syllabus 2018. Kindly share this Tamilnadu Police SI Technical exam syllabus to your friends too. When the exam date will release??? hi sir im thamendhiran.. im completed B.COM(CA). can i apply for this exam? Hello Mr. I have completed my Bsc operation theatre and anaesthesia technology? Am I eligible? Comment:iam bsc maths eligible in finger print si exam plz reply sir? i have completed BE ECE ..
am I eligible to take apply for these job Sir.. please guide us! How can I collect materials for general studies?? I think the school books are not enough ! Am I wrong? sir i i have complite b.tech (civil engineering ) from uttarakhand. can i apply for special force (SI) in English language.. Please share us the previous / sample question paper link for the same . sir, have any old questions? or available any link? Any physical fitness for test ? Can I eligible for writing the exam , sir. Sir. I have to finish BE ECE, I’m a diverse candidate. My age 30. Can I ably. You can able to apply. The age limit for you is 35 Years. You have more chances to get the job. 04/05/1987 is my date of birth …. Am i eligible ???? May i apply ?